For thousands of years Celilo Falls, a string of water falls on the Columbia, were a bountiful fishing ground for the Native Americans who clustered their communities around them, and an impressive sight. The riverbed of the Columbia narrowed to a mere forty feet across, and the river dropped over eighty feet within a half mile. Not a fun situation for boats, but a great situation for fishermen who erected scaffold perches over strategic spots and benefited from the multitude of disoriented salmon, lamprey, and sturgeon. The nine mile stretch of Celilo Falls lies about twelve miles east of where The Dalles is now, but you can’t see it any more (unless you have the right sonar equipment). In the 1950s the Army Corp of Engineers began building The Dalles Dam, to generate electricity and make that stretch of the river navigable. 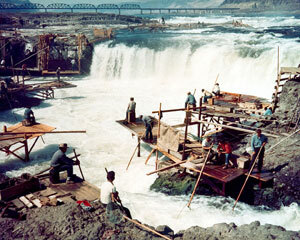 On March 10, 1957 the dam held back the water and the falls disappeared in the rising water. grandparents overlooking Celilo falls before it was flooded. What I want to know is what you younger generation think of the flooding of the falls? Do you think the Corps of Engineers had a right to flood what “our way of life” was and what the Creator had given us to survive. Fishing is a way of life. Salmon is one of our Sacred foods. Elk/deer meat,roots and huckleberries is the other sacred foods we live one year ’round. If you were a tribal member & Native American, what would you feel? I believe my grandma Esther Jaksha went to school with your mother. She grew up near the area that is now Dallesport, WA and has told me stories about her childhood including going to school with a daughter of Chief Tommy Thompson. She has many fond memories of this area and the Celilo people and was deeply saddened when the Corps of Engineers flooded the falls. Thank you for your time.